Many businesses create a blog with the best of intentions but then neglect it. An active blog is a great tool for SEO and building authority for your business. To get the maximum benefits, however, you need to post regularly to your business blog. When you have a business, it’s always beneficial to establish yourself as a knowledgeable authority in your industry. You do this not by saying how great you are but by publishing useful content that your readers care about. For example, if you sell pet-related products, you can post how-to content on dog training. If you’re a realtor, share home buying and home improvement tips. These type of blog posts show everyone that you’re a true expert in your field. One of the best reasons to post consistently to your blog is that it’s an effective way to drive new traffic to your website. Every time you create a post, you’re giving the search engines content that you can rank for. You can also place links in your business blog to your website or product pages to help generate new leads and sales. The more you know about your customers’ needs, problems and habits, the better you can serve them. Use your blog as a tool to find out as much as possible about your audience. Ask questions and post polls and surveys. Be sure to respond when you get comments. When you post helpful content, there’s a good chance that people will share it on social media. You can also encourage your employees to post helpful content to your blog and share it on their own social media accounts. The more “great content” you and your employees post to your business blog, the more chances you have for posts to go viral. 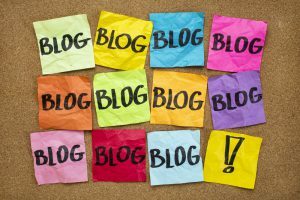 Don’t just use your business blog to promote yourself. Remember to tell people about any volunteering, charity work or fundraising for good causes that you do. This is a chance for you to show your readers how you give back to the community. Your business blog is not only a useful tool for finding new customers. It can be equally helpful for recruiting employees. To do this, you want to emphasize any facts that show your company is a great place to work. Showcase your employees’ accomplishments and encourage them to post content such as quotes and photos. Another tactic is to post this type of content on your social media pages and use your blog to link to it. Customers tend to trust testimonials and online reviews more than advertising. The principle of social proof is a strong motivating factor for many people. When your readers see evidence that others endorse your products, they’re more likely to try them. So it’s always a good idea to post testimonials and reviews to your blog. Data is always helpful for learning more about your customers and creating more profitable advertising campaigns. What’s good about blogging is that it gives you a cheap way to do this. By studying which topics and keywords your customers respond to the most, you can gain valuable insights into which keywords to target in your paid advertising campaigns. These are some of the top reasons that consistent blogging is beneficial to your business. Another way to help with business growth is invoice factoring, a type of funding that helps you improve your cash flow. If your business is growing and you’re looking for some capital to help you manage your growth, contact Riviera Finance.